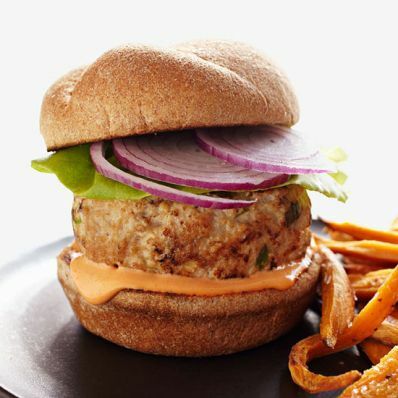 1 of 4 In a large bowl, combine turkey, scallions, soy sauce and five-spice powder; form into 4 patties. 2 of 4 Heat a large nonstick skillet over medium-high heat. Add burgers and cook 3 minutes per side or until internal temperature reaches 160 degrees . 3 of 4 Combine mayonnaise and sriracha; spread 11/2 tsp over bottom half of each bun. Place burger on bun and evenly divide remaining mayonnaise mixture over each burger. Add lettuce, onion and bun tops. 4 of 4 Serve with Sweet Potato Fries (recipe below), if desired.